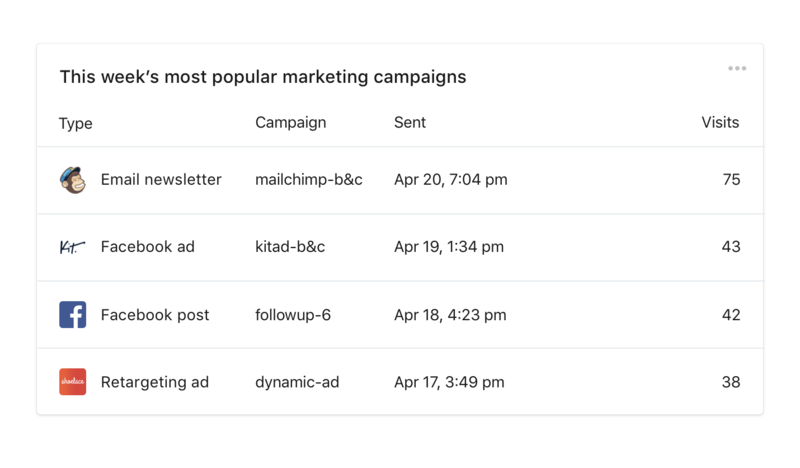 Shopify is announcing a number of new APIs for developers at its annual Unite developer conference in San Francisco today, but the new Marketing Events API might be the most interesting, especially for sellers using the platform. Basically, it allows the many developers already building marketing plug-in apps for Shopify stores to more easily show what their tools are doing for merchants, directly within Shopify itself. And, it could eventually recommend winning marketing strategies without any human intervention. For instance, a newsletter integration provider could show Shopify store owners how many sales are resulting directly from email campaigns, and do so without requiring any heavy lifting on the part of the merchant like messing with manual UTM code creation and tracking. The results will also show up as visualized data in Shopify’s store backend for users, which is a huge deal when you consider many small sellers have never really thought hard about what marketing can do for their business, let alone know where to go looking for worthwhile analytics. It’s clear that people build things with it, and run campaigns, but it struck Patricio that it’s very difficult for merchants to track things. It’s fairly easy to identify the sources of traffic to the store, but when you don’t necessarily know what specific action caused that traffic, it’s hard to identify your best practices for marketing and reconfiguring your campaign in a way that will lead to growth. Patricio found out how hard it was based on experience with his own store on Shopify, which sells cured meats. He had to build his own tool, using pretty hacky methods, to find out what was working about his marketing efforts and what wasn’t as he was trying to increase his shipment volume to help make sure he could keep his drop shipper. In aggregate, it’s obvious that marketing is doing lots of work in making stores successful. Patricio told me that 50 percent of stores on the platform have marketing apps installed, and those that track marketing using UTM codes are 10 times more successful than those that don’t. To that end, the Marketing Events API is also going to help give direct, in-line feedback to shop owners about what they can do, and when. “We can look at what’s working in terms of marketing for that category, and we can make recommendations specific to the merchant about what they should do to improve,” Patricio said. Those recommendations can be inline, one-click calls to action that take merchants to the marketing activity they need to do to get those improvements others in their category are seeing. Basically the goal is to make merchants more sustainable and more likely to grow over time, which benefits Shopify. This should also benefit merchants building apps for the platform, so Patricio is confident that more developers will join in once they see how well this works in terms of adding some transparency to the often murky marketing process. Recommendations are based on anonymized aggregated category data, Shopify says, and so won’t ever reveal the exact secret sauce of your closest competitor. But it sounds like marketing recommendations could become more sophisticated over time, letting Shopify offer a more or less full-service marketing engine for small businesses that otherwise wouldn’t have access to those kinds of tools.